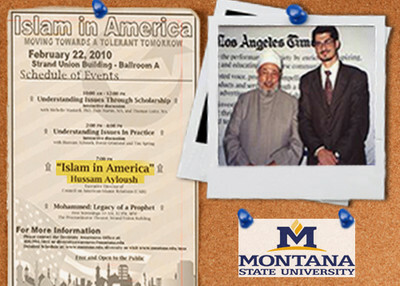 Take a Los Angeles-based director of a national Islamist organization and put him before about 50 people on a Montana university campus, and you'd hopefully get an enlightening and candid talk about his faith, his organization and the struggle against radicals. CAIR has been supporting terrorists during rallies, seminars and University events for years. Why have we waited so long to probe them or carry out investigations, when we solid evidence and proof by pictures or video, that these people are invovled in radical islam in our own back yard. They use our freedoms to thier advantage and its unfortuante that we cannot do anything about it.